The Kurdish regional government and Exxon-Mobil signed an exploratory deal in October 2011 which reportedly has been “frozen” by the Malaki government, in which legality of the oil deal is being disputed. However, representatives of the Kurdish government deny the reports. Iraqi Kurdistan, a semi-autonomous region in northern Iraq, has long sought independence from Arab governments, citing a long history of discrimination as an ethnic minority group, especially under Saddam Hussein leadership. However, the long-running Kurdish national movement continues to be as much a struggle for self-governance as it is for control over resource wealth. The current President of Iraqi Kurdistan, Massoud Barzani, has rejected the assertion that an oil deal with foreign companies must include Baghdad. The struggle for control of resource wealth is linked to a broader struggle for autonomy and independence for the Kurdish people. The claim is based largely upon a distinct culture, language and history that is unique and apart from their Arab neighbors. Outwardly, the estimates on oil endowments have been quite large, as the Kurdistan regional Government estimates that output could reach more than 1 million barrels per day. This kind of robust output would place Kurdistan among the world’s top oil producers. While the exploration and development of such resources has been relatively easy for nations, particularly those in the Organization of the Petroleum Exporting Countries (OPEC) cartel, any oil deal must be jointly agreed upon by the Kurdistan regional government and the central Iraqi government in Baghdad. 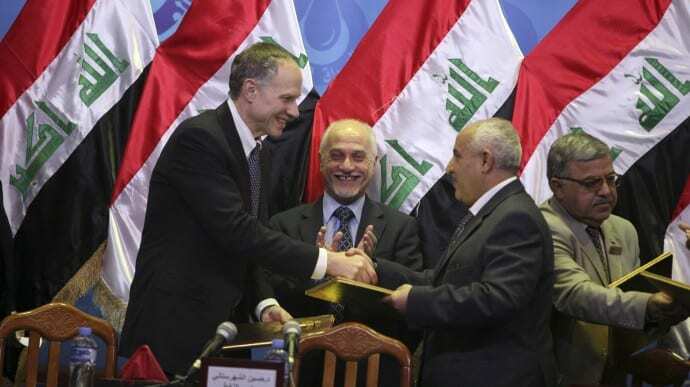 The Bush administration helped draft the Iraqi Petroleum law in 2004. Should the legislation pass, multinational oil corporations would be allowed to operate many of Iraq’s oil fields. Previously, all of Iraq’s 80 oil fields were state owned and operated. However, in the 1990s, Saddam Hussein granted some limited production share agreements to Russian and Chinese oil companies. Despite the influx of some foreign companies, much of the Iraq’s oil remained nationalized during this time. The delay in passing the Iraqi Petroleum Law is partly due to public opposition. Many Iraqis fear that foreign development could result in the exploitation of Iraq’s resource wealth. However, for the Kurdish north, exclusive agreements with multinational oil companies could be yet another step in developing greater autonomy and independence. The legality of independent Kurdish oil deals has been disputed, even in international bodies like the United Nations (U.N.). However, In 2009 the U.N. proposed a power-sharing government in which operation of Kirkuk’s oil fields will be administered by both Baghdad and Kurdistan. Profits from the abundant oil wealth would be split between the two governments, according to the plan. However, years after its proposal, it appears that the two belligerents remain far apart on the issue, unlikely to accept the U.N. power sharing plan at this time. Additionally, the Kurdish government has long claimed that the Maliki government has withheld oil revenues, preventing much needed cash from flowing to Kurdistan. On April 1, the Kurdish regional government halted all oil exports passing through Baghdad-controlled Iraq. Even though the region has produced around 500,000 barrels of oil per day, Kurdish authorities claim that little of that revenue from this oil has made its way to Kurdistan. In May, Kurdish Minister of Natural Resources Ashti Hawrami announced plans to develop a pipeline with Turkey. Assuming the plan goes through, Kurdistan could begin exporting oil to Turkey independent of Baghdad as early as 2013. However, amidst the escalating conflict over oil rights lies a central, unresolved grievance: the demand for a fully independent Kurdish state, one that is internationally recognized with agreed upon borders. The Kurdish demands for independence stem from a unique history, language and culture apart their Arab neighbors. Additionally, Kurdish security is promoted as an imperative given the oppression suffered during the the rule of Maliki’s predecessor — Saddam Hussein. The Kurds suffered a genocide under the Baathist dictatorial rule of Saddam Hussein. In 1988, during the close of the Iran-Iraq war, the Iraqi Army carried out a campaign dubbed the “al-Anfal” campaign against residents living in Iraq’s mostly Kurdish north. The attacks destroyed some 4,500 mostly Kurdish villages and displaced more than a million native residents. Estimates on the numbers killed during the attacks vary with official Iraqi government estimates placing the number at 182,000. Some rights groups and independent sources have estimated that the total is much higher because of individuals who vanished during the incursion. Amnesty International conducted an exhaustive independent report, finding 17,000 names of people who had disappeared during the government attacks. While “al-Anfal” campaign largely affected Kurdish communities, other minority groups, including Yazidis, Assyrians, Jews, Shabaks and Mandeans, were affected by the onslaught and suffered casualties during the government attacks as well. The “Arabization” of areas with majority Kurdish populations was developed as a government strategy to seize control of key towns with access to Iraq’s abundant oil resources. Indeed, many poor Arab residents from other parts of Iraq were lured to the oil city of Kirkuk with government incentives, including access to inexpensive public housing. Native residents were evicted and sent to concentration camps where most were executed en masse. The events that transpired in 1988-1989 have never been fully reconciled and a tenuous relationship still lingers years after the brutal government attacks on the Kurdish population. The Kurds enjoy some limited cultural autonomy and self-governance but have not received official U.N. recognition for an independent state. The region is governed by a parliamentary democracy with a regional assembly. The Kurds won this limited independence in 1970 after a protracted war with the Iraqi government. The Kurdish people are one of the largest ethnic groups in the world without an independent state. Numbering almost 30 million worldwide according to the CIA World Factbook, the Kurdish people continue to seek an independent state encompassing all, or most, of historic “Kurdistan”. This region includes large parts of Turkey, Iraq and Iran. Additionally, small populations of Kurds populate parts of Syria and Armenia, further complicating a difficult struggle to form a viable, contiguous state. This entry was posted on June 25th 2012 at 3:31pm/15:31 and is filed under Live News Column 1, Politics. You can follow any responses to this entry through the RSS 2.0 feed.